With excitement and concern running high today throughout the city, the NYC Employment and Training Coalition and its members insist that an equity-centric approach that prioritizes the development of a local talent pipeline of current New Yorkers from marginalized communities be woven into the fabric of the agreement between New York City and Amazon. The news this week of what Mayor de Blasio has described as “the largest economic development deal in NYC history,” is exciting and potentially historic for the city’s business ecosystem. In many ways, this validates New York City’s dream of becoming a true technology ecosystem, one that rivals any other region in the nation. However, it must be met with some apprehension as we know from experience that this does not come without potential consequence. Marginalized communities across the city and in the public housing near this development may be left to wonder whether they will have a real opportunity to benefit from these new jobs or once again see career opportunities stay tantalizingly beyond reach. NYCETC, including our more than 150 members, stand ready to partner with city and state administrations and Amazon to grow a talent pipeline of everyday New Yorkers for the jobs to come. During the cultivation process, the city consulted a number of our members and other technology focused training programs on the potential benefits of an Amazon Headquarters in New York. Consulting the provider community was a step in the right direction and for this we applaud our partners at the city, including the New York City Economic Development Corporation. However, in order for Amazon’s central promise of thousands of middle-income jobs for current New Yorkers to become a reality, it will require deep collaboration with the City, local residents, training organizations, and Amazon’s leadership. Collaboration must be actively centered around economic equity and access to viable career pathways for marginalized communities, including New Yorkers who reside in public housing or are homeless, have low literacy levels or lack a highschool diploma, who are justice-involved or have disabilities, and countless other New Yorkers. Collaboration provides a unique opportunity for Amazon to be an industry leader in diversifying NYC’s tech and business ecosystem. By working with community partners, Amazon can ensure that local residents at all skill levels are given the training and job placement opportunities to fit into Amazon’s future workforce. Let’s keep in mind that the root problem here is not Amazon or business for that matter. More jobs equal an increased “potential” for families to become self-sufficient and provide better experiences for themselves, their families, and their communities. However, for this “potential” to become a reality, it will require political will to focus on low-income marginalized communities, and those New Yorkers who may face steep learning curves. Progressive politics must be centered around equity — an equity-centric approach to economic development which properly develops communities like Long Island City, lifts people up, and decreases the chance of individuals and families being displaced. Our members are the epicenter of communities and know that talent exist everywhere. They are responsible for developing the professional and technical skills of hundreds of thousands of New Yorkers, many of which who need our services and would benefit the most from targeted investments and access to Amazon’s jobs. These New Yorkers require training of all levels, from adult literacy and HSE to coding, mobile and web development, data science, and cyber security. 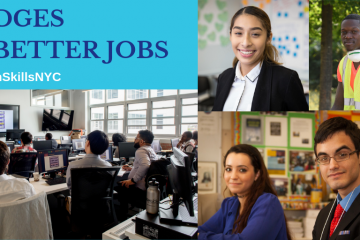 In order to meet the scale of potential jobs with current New Yorkers, our current workforce system will need the same scale of funding to create a large scale talent pipeline. An equity-centric approach is our priority, and NYCETC will work with our members, and friends and partners at all levels of city and state government, who we trust are ready to ensure we move past the excitement for the potential of these investments and focus on being excited about making investments in people and communities a reality. 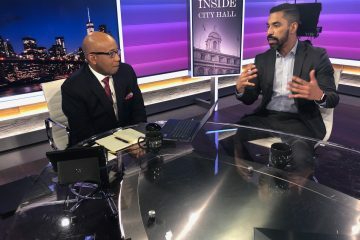 Driven by the question of how serious City and Sate officials and Amazon leadership are about the scale of employment and training investments needed to create access for all New Yorkers to the 25,000 job opportunities touted in this deal, NYCETC has been featured by MSNBC and the Wall Street Journal in their coverage. Above, you can see the full interview with Mayor de Blasio and the MSNBC team. During the interview, Willie Geist quotes NYCETC’s concerns in his question regarding low-income New Yorkers’ ability to benefit from Amazon’s job opportunities. Below is a transcript of the exchange. 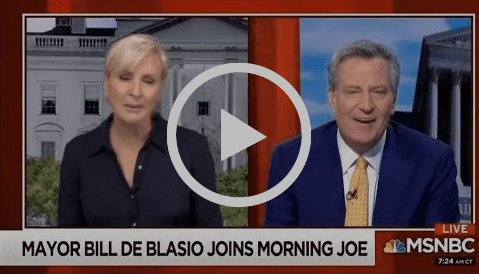 Willie Geist: The head of the NYC Employment and Training Coalition says the 15 mil promise by Amazon to go into some of the NYC public housing to have job fairs and things like that is a drop in the bucket, and they believe that’s just something symbolic to close the deal. What do you say to those working class, and really poverty line, folks who live in Queens about this project and why they will be a part of it and they won’t be locked out? De Blasio: So, 25,000 [and] up to 40,000 jobs to begin with…that’s going to create a lot of other jobs in the surrounding area. We always know this – you bring that kind of economic presence into a community, a whole lot of other businesses build up to support it. A technology community – 350,000 jobs in the whole city – that’s going to grow a lot more. This is going to be a consolidating moment. For the borough of Queens, unquestionably this sends a signal that Queens is now an ever more important economic center. That’s gonna benefit New Yorkers of all backgrounds, all incomes, there’s no question in my mind. But here’s the other piece – when I tell you we’re gonna get $13.5 billion dollars in tax revenue in the coming years, we’re gonna use that to create opportunity. We’re gonna use that to create affordable housing. We’re gonna use that to create job training programs that reach hundreds of thousands of New Yorkers ultimately. So I think the important thing to recognize here is a smart government says, ‘we’re here to bargain for the people. We need to get a lot back for the people.’ There’s no question in my mind that that’s what we are going to achieve here. New York City is already moving in the right direction. We have said we’re gonna be the fairest big city in America. We’re gonna make sure there’s opportunity for all. This is gonna help us do it. If we didn’t have them, we would be missing an opportunity to really reach a lot. Gov. Andrew Cuomo and Mayor Bill de Blasio both spoke in superlatives Tuesday when they announced a deal to help Amazon.com Inc. build an additional headquarters in Long Island City, Queens. They trumpeted the record-breaking combined incentives of nearly $3 billion from the state and city to help the online-retail juggernaut build a campus along the neighborhood’s waterfront. And they spoke of an estimated $27.5 billion in revenue over 25 years from Amazon’s arrival, which they said could lead to as many as 40,000 new jobs. But when details of Amazon’s contributions to the community were revealed in a memorandum of understanding Tuesday, some local leaders said the deal fell short of addressing New Yorkers’ true needs. Amazon plans to offer an initial $5 million in “workforce development,” and to host job fairs in New York City Housing Authority developments, with the city and state kicking in an additional $10 million. But the memorandum doesn’t give a specific target for local hires. 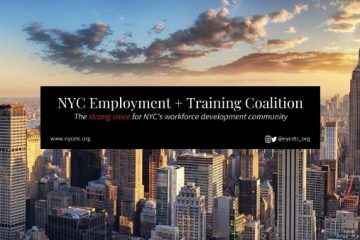 Jose Ortiz, Jr., executive director of the NYC Employment and Training Coalition, said $15 million for workforce training is a “drop in the bucket” for what is needed. Even a 10th of the subsidies offered to Amazon would have been better directed toward city-run job-training and development, he said. “That number is shockingly low, and I don’t think it comes even close to what would be required to adequately train people coming from Queensbridge and Ravenswood to take on these jobs,” he said, referring to two NYCHA apartment complexes near the planned Amazon campus. A second additional headquarters will be built in Crystal City, Va., the company confirmed Tuesday. Amazon says the average annual salary of employees at the Queens campus will be $150,000, but community leaders doubted whether local residents would get any of the high-paying positions. “We have to make sure that the opportunities that Amazon affords [are] evenly distributed, or at least accessible by all,” said Resident Bishop Mitchell G. Taylor, the CEO of Urban Upbound, a job-training program in Long Island City, and a pastor in the nondenominational Center of Hope International, which is next to Queensbridge. Mr. de Blasio said Amazon would deliver a diverse mix of jobs and that residents at Queensbridge, the largest public-housing development in the U.S., would get a “leg up” on them. Amazon, which promised to invest more than $2.5 billion in the construction and operation of its new campus, has pledged infrastructure upgrades to Long Island City, including adding parks, offering space for a new public school and improving transportation. “We thank you and look forward to being part of your community,” he said. Mr. Cuomo agreed that Queens is the perfect location for Amazon. “No state and no city is improving infrastructure as much…or as quickly,” he said. But critics said the deal doesn’t commit Amazon to helping with improvements to the city’s deteriorating subway system, which is run by the Metropolitan Transportation Authority. The absence of such a provision prompted Lisa Daglian, executive director of the Permanent Citizens Advisory Committee to the MTA, to urge agency board members at a meeting Tuesday to ensure that Amazon would fund transit investments as part of the development deal. “What’s good for Amazon should be good for transit in Long Island City and in New York City,” she said. George Stamatiades, president of the Dutch Kills Civic Association, said he had some concerns but sees the deal as an opportunity to improve the neighborhood. “I’m all for progress and the jobs it’s going to bring,” he said. Since moving to Long Island City in 1973, Mr. Stamatiades has had a firsthand view of its evolution from a mostly industrial zone to a residential community. “I realize when all these people come, they’ve got to improve the infrastructure and the schools. But we certainly welcome progress,” he said.